Brian Ortega and Max Holloway are set to fight at UFC 231 on Saturday for the UFC featherweight belt. With uncertainty swirling around the fight, Ortega still isn’t confident he’ll be fighting Holloway. He already went through the hype of fighting the Hawaiian in July and it was a big letdown when he heard the news that Holloway had to pull out. Now, with the fight just days away, Ortega knows he has a job to do but isn’t emotionally invested into it like he was in July. 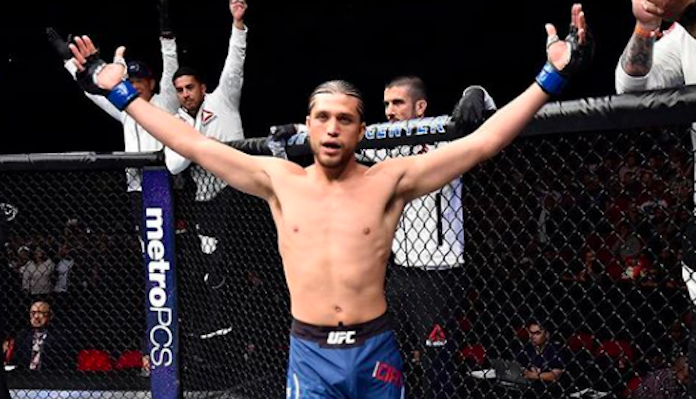 If Max Holloway isn’t able to fight in the UFC 231 main event, Brian Ortega will be matched up on short notice with streaking Brazilian contender Renato Moicano, who is being flown into Toronto as an alternate. Ortega already holds a win over Moicano, having recently defeated him submission. It has been Ortega’s dream to be a UFC champion and on Saturday he has the chance to do so, whether Holloway is across the Octagon from him or not. Do you think we will see Max Holloway fight Brian Ortega on Saturday?